← Would Millard Fillmore’s VP pick be preferable to Tim Kaine? Has it been 10 years already? Job 7:6! John Allen at Crux reminded me of the anniversary. 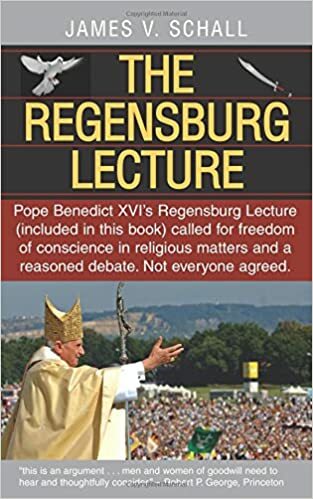 Ten years ago Benedict XVI delivered his famous Regensburg Address which sparked huge controversy over his inclusion of the example of Islam and their view of Allah in regard to reason and will. You also want to read about Benedict XVI’s amazing Regensburg Address with the help of James Schall. Here is the audio of the talk. I haven’t been able to find a full video of the Address. Odd. Another with Italian voice over, but decent video. This entry was posted in Benedict XVI, The Drill, The Religion of Peace and tagged Benedict XVI, Islam, reason, Regensburg Address, Religions of Peace, Sam Gregg. Bookmark the permalink. I guess it could be said that those who deny reason then are reasoniphobes? or Godiphobes? logiciphobes? natureiphobes? The Catholic Church is the inventor of reason and scientific thought. There is a simple scientific test that we can perform to prove or disprove anyone’s belief as to if they are a boy or a girl. 99.9999% of the time the answer will be very clear. We need to dispel this superstitious hocus pocus that these people believe in. The same test, by the way, can identify if the baby inside the womb is of the same person and body as the mother and since the answer is no mothers have no right over the others body to decide if the baby lives or dies. Danke schön for all the (especially audio) links, Father Z! Dan, I suspect Aquinas might have something to say about his debt to Aristotle (before Christ). What’s the scientific test you mention re boy or girl? A DNA test can quickly settle the question of boy or a girl. Which quickly settles the question of what someone believes is true about them selves is correct in incorrect. I am a little outside of topic on my comment but if I am going to be an islamphobe, homophobe, trangenderaphobe. Then the reverse must be realityiphobes. Catholic’s believe in reality and now are bring asked to believe instead in someone personal made up reality. Dan, It doesn’t even require DNA testing, a simple cheek swab to look for Barr bodies in neutrophils. Fantastic essay by Sam Gregg. Thanks for the link! Un-ionized, not for Turners XO (women without Barr bodies), Kleinfelters XXY (men with some Barr bodies) or depending on the sample, mosaics. And doesn’t address masculinization from congenital adrenal hyperplasia. Or feminization from androgen insensitivity syndrome. I thought Dan knew of something more accurate than SRY gene/TDF protein. the male vs. female discussion is mainly in here centered on people who are unequivocally male or female but who claim not to be. “It’s amazing, isn’t it…the things that survive the ravages of time and taste. This simple prelude, for example. Bach will, quite probably, outlive us all. Man produces little that is lasting; truly lasting.